So, my first project return is my string quilt. I started this one last year. I love what all the blocks look like when they are together! I just need to finish about 45 more blocks since they end up 6.5" square. I should have made them larger but no changing now. I have probably 18 made so far. I'm hoping to return to making at least one a day. If I skip a day, then the next day I need to make two... and so on. Also, over the last two new years holidays, we really weren't ourselves. We found ourselves waiting for biopsy results and as much as you try, that's all you can think about. We received the results of DH's biopsy two days ago and we continue to be blessed. The cancer did not return and did not spread. It was just a progression of an autoimmune disease that continues to need to be managed. Yeah! Thanks for your thoughts and notes! These are great string-eeez! They are playing so nicely together! I've found WIPs in my stash and some have too few blocks. Sometimes, I find myself feeling WAY UNDER-motivated to make more. 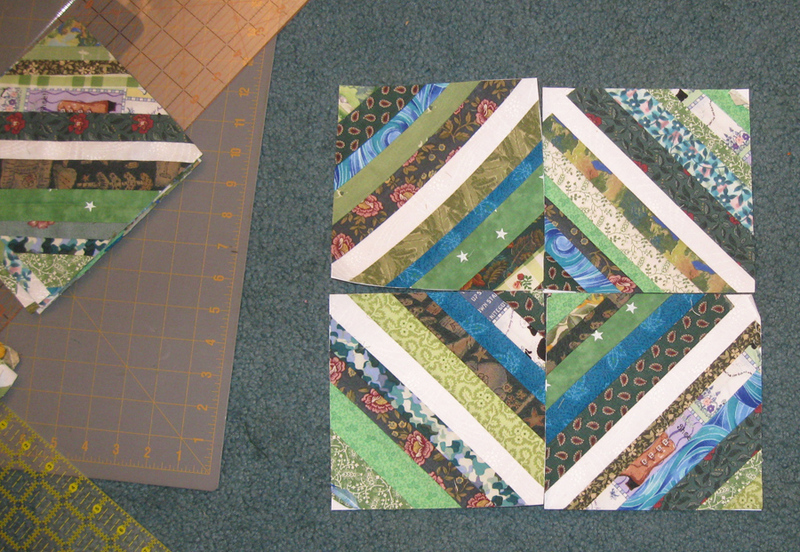 I've sewn the ones I have together with plain or different blocks inbetween. Or I've just added some sashing. If, that doesn't work...I do a fun fabric and make several borders. You might feel like making more...they ARE quite pretty!